It's a funny thing to walk into a house for the first time. It is rather exciting, intriguing even, and don't you just want to open every door, explore every cupboard and look out of every window? I always find there is a level of mystery surrounding any building, any home that you have not yet explored yourself. Balcombe Place was no different, in fact walking into Balcombe Place was such a thrill, we just had to share it with you. The whole property was vacant, and the majority of the rooms were empty of furniture, with only questionable carpets and the odd curtain furnishing its large empty spaces. Balcombe Place was first brought into the family in 1905 when it was purchased by 1st Viscount Cowdray for his daughter and her new husband, 3rd Baron Denman. The house's most colourful stories come from the time that follows this, which I promise, we will tell you all about in our next chapters. Many changes have been made to the property since 1954 when Lord and Lady Denman died. The property became a prep school for boys, and since 1985 the property has been a care home. In this chapter, I am going to focus on the dreamy, fabulous, extraordinary reception rooms. We have many bedrooms here at Balcombe Place, 33 to be exact! While we will bring the fourteen bedrooms in the prestigious wing back to life, the other bedrooms will return to a use closer to what they would have been in the early 1900s. This includes, the kitchen and service areas, further dining spaces, offices and storage. Our great shock is how three of the reception rooms, the Business Room, the Dining Room, and the Billiard Room had been turned into bedrooms! We entered through the back door the only keys we had at the time and walked with trepidation through the commercial kitchen. A shell of a room with ageing health and safety stickers and very little in the way of useful appliances. Luckily the red tiled floor remains intact and bar the questionable plastering on the ceiling it looks to be in good condition, well, it will be after a deep clean! Through the kitchen door, we entered the service wing. Balcombe is split into two wings, the prestigious wing, and the service wing aptly named given the variation between the room sizes and grandeur of decoration, the views and the external architecture. The service wing now hosts eight bedrooms on the ground floor and eight on the first floor almost all with en-suite bathrooms. Each bedroom is slightly different, in size and aspect. All have a rather distinctive smell and, for the moment, the same is true for the bedrooms in the prestigious wing. Such fun! Slowly walking through into the Main Hall, part of the prestigious wing, the wooden panelling and the fireplace are what catch your eye first that and the scary carpet (don't worry, most of that is gone now!). We truly believe our fabulous fireplaces are the signature of the rooms at Balcombe Place, and not just in the reception rooms, the bedroom fireplaces are divine too! Main Hall Fireplace - Those tiles!! The Main Hall is the hub of the house: the Music Room, the Billiard Room, the Library and the Drawing Room all lead off this huge room, I didn't know which door to walk through first. 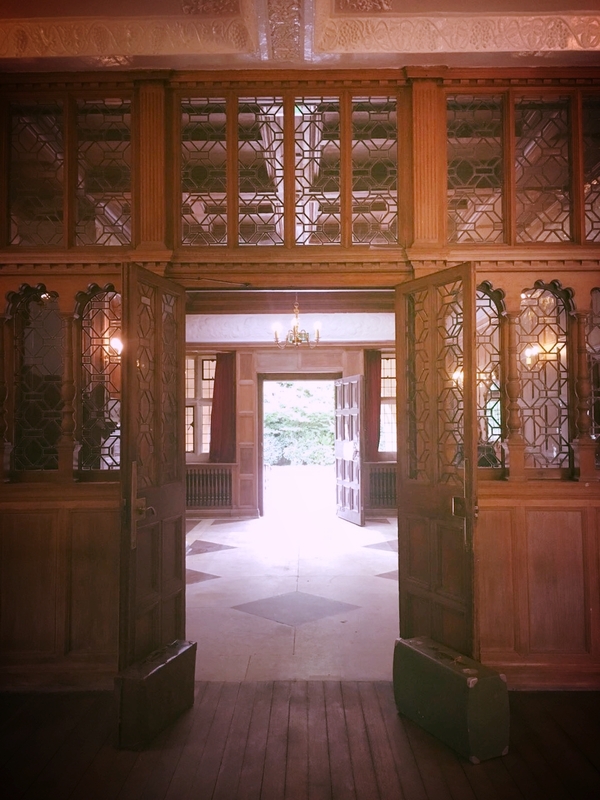 The Entrance Hall is accessed through a large wooden front door, with stunning glazed double doors internally, which leads into the Main Hall. We sneakily lifted the corners of the carpet in the Hall, hurrah, marble below! Eeekk! Nothing quite prepares you for Balcombe Place, the history and the decor is so extraordinary, so unique, so special, it takes your breath away. I was on my knees, head in my hands in complete awe and shock when I first walked around, speechless! I had to strip off a couple of layers too, the heating was set so high, sweltering, at least we know it works! The Music Room... In 1899 the Music Room was added by architect G C Horsley. The room integrated a large, electrically powered organ with organ pipes and a small choir gallery. Unfortunately for us, the organ never did work properly; however, it makes for a magnificent room. We really would love to fix the organ but unfortunately, this beast is one we are not in a position to tackle just yet. To the left of the organ is an iron staircase, one of those tight, spiral staircases that you really have to concentrate on when climbing or descending. It goes up to the gallery, but also down to a small basement that holds the motor for the organ along with many cobwebs and a lot of dust. The patterned carpet was also in here, but, luckily for us, and you, stunning floorboards awaited us in every downstairs room. I promise to show you some carpet soon... The joy of this room is that very little will need to be done to; yes, we have a few missing organ pipes and the ceiling definitely needs painting, but otherwise it's almost perfect as it is. That is, until you really, really look. Every panel to one side of the room has a white, flaking, we hope, varnish layer! Uh oh! It looks as though we are going to have to turn our hand to sanding in the near future. The Music Room!!! A couple of missing pipes currently!! The Billiard Room, next door to the Music Room is the saddest of the reception rooms at this stage. With false walls added to create a small, windowless bathroom in one corner and all the boxes of the care home administration collected in here, it definitely feels like the end of a long road. There are two archways that lead into the Music Room, but they were filled in by the prep school and stand out as an addition rather than part of the original property: the colour of the wood is the big giveaway, I already want to get a sledgehammer to them! The Drawing Room and the Library are two rooms I am desperate to tell you about. Both overlook the lawns and have stunning views of the Sussex Downs. They are both extraordinarily decorated, with a lot of the original features still in place, you'll be disappointed to know there is no carpet in these rooms, just the stunning floorboards. The Drawing Room hosts the MOST incredible marble fireplace, huge, imposing, elegant and detailed, a stunning element to have in such a house! The Library is everything you would imagine. A large stone fireplace at the centre of the room and wooden book shelves lining the walls, it is calling out to become a library once more. I can't wait to fill the shelves with books, pretend to write letters on a fabulous desk and play cards on a felt table. Many, many moons ago a film company used Balcombe Place for a number of scenes, and in doing so stained the wooden shelves, panels and walls a darker colour and never returned them to their original state. When you are in the Library it works, it's the dark, moody wood so many historic libraries and studies have; the sadness is to see the badly painted areas that reveal pretty, William Morris style, floral wallpaper which lined the back of each shelf, now completely lost. Through this journey, we are discovering fantastic truths such as revealing hidden fireplaces, finding the missing lamp in the cellar and realising some of the wallpaper is actually original. What one must also realise is that with this comes sadness and disappointment. It is a sadness we have come across too often but one we must accept and try to understand. Missing artefacts, rooms not loved enough turned into something they should never have been and the general realisation of how unloved and disrespected the property has been over the years. This has resulted in lost parts of not only the property but history. Thankfully, this is all going to change! Balcombe Place is now back in the management of its true owners! The family, with a little help from friends, are rediscovering this fabulous property and finding out the history of where it all began in 1905. I am here to tell you all about it! To tell you to have faith, watch this space and support us on our quest. If you have ANY information or knowledge about the property and its history do please pass it on to us, we are craving all and any new and exciting stories! Here's to the future. Here's to rediscovering a once lost home.